My ancestors worked herding cattle and driving them to market, but I work mostly as a guard dog or police dog. Because of my breed�s instinctive bravery, my relatives were chosen as message carriers during the two World Wars and many of them died in the line of duty. I am very fond of people, quick to learn, and have a watchdog mentality, which makes me a pretty good choice for a family pet. I am no couch potato, but I don't need as much exercise as some other large breeds do. My coat is shaggy and thick, so it must be brushed regularly. It will also need to be trimmed and clipped if you want me to maintain my Bouvier �look�. When fully grown, I am between 23 and 27 inches tall (58.4 to 68.6 centimeters) and I weigh between 60 and 80 pounds (27 to 36 kilograms). 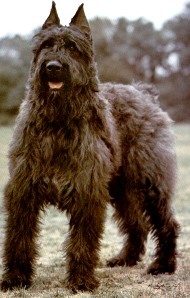 We have no Bouvier Des Flandres Breeders listed at this time. Click here to place your Bouvier Des Flandres Ad!